An early human who lived between two and three million years ago had teeth and jaws that functioned like a nutcracker, allowing them to bite through nutshells with ease, according to a new study. The finding may put Australopithecus africanus in a shell-chomping category with another human ancestor, Paranthropus boisei, dubbed 'Nutcracker Man' by scientists last year for having super-thick teeth. Dr David Strait, lead author of a new study on the fossil, explains that "large nuts and seeds may have been foods that were eaten during times when other types of food were not available." "At those times, nuts and seeds may have been crucial to survival because if you couldn't eat them, then you'd either have to move to a new habitat or die," says Strait, an associate professor of anthropology at the University at Albany-SUNY. A. africanus has long puzzled scientists because of its massive jaws and teeth. Columns of bone positioned alongside the sides of its nose apparently buttressed the face and reduce stress while eating. Various theories for the features have been proposed, such as the possibility that the early human ate large volumes of food or needed to rip it apart. To resolve the mystery, Strait and his team entered the skull's features into a computer to create a testable model. For comparison, they also created a computer model of a toothy modern primate, the crab-eating macaque. The National Science Foundation and the European Union supported the study, which is published in this week's issue of the Proceedings of the National Academy of Science. The researchers applied two sets of muscle forces on the models: a normal bite simulating what it's like to chomp into a piece of soft fruit, and a maximal bite into the shell of a nut or seed. 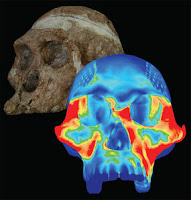 They ruled out high volume eating as a theory, since the early human's unique facial design wouldn't have been necessary for that. They also found that the individual wasn't well built for processing tough foods. Instead, they think its skull design was optimal for cracking nuts and seeds, spitting out the shells and chewing the soft inner contents. Strait is quick to add that, "these humans may have preferred soft fruits or other types of vegetation when they could get them...so large nuts and seeds may have been foods of last resort." Since the early humans shared habitats with different types of antelope, "it is possible that they could have scavenged meat when they found it" too. The discoveries suggest that the modern human body form evolved, in part, to match what food we could find. Dr Matt Sponheimer, a University of Colorado at Boulder anthropologist, says the study "takes some old ideas and looks at them in new ways, and also makes some bolder interpretive leaps." "This is one among several studies of late that have challenged conventional wisdom about the diets of our fossil kin," Sponheimer says, "and I believe that certain of its claims are likely to prove controversial."